2014 Turn Up Conference Wrap Up | Turn Up! 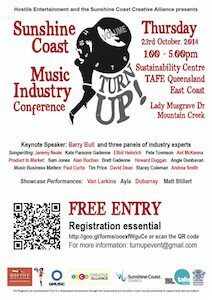 Over 100 musicians and music industry personnel turned up to the inaugural Turn Up Sunshine Coast Music Industry Conference on Thursday 23 October 2014. Presented by Hostile Entertainment and the Sunshine Coast Creative Alliance and held in the Sustainability Centre at TAFE Queensland East Coast Mooloolaba, the free event ‘sold out’, reaching registration capacity the day before the event. Music retailing legend, business book author and motivational speaker, Barry Bull opened the inaugural TURN UP conference, with his very interesting keynote presentation “Take the Bull by the Horns”, based on his latest book of the same title. The TURN UP program also included three music industry panels. The panels were comprised of high profile industry professionals, who offered their insights into topics of Song Writing, Product to Market and Music Business Matters. Ant McKenna facilitated the Song Writing panel with Pete Townson, Elliot Heinrich, Kate Parsons Gadenne, Jeremy Neale and Ayla speaking on this panel. Angie Dunbavan facilitated the Product to Market panel with Alan Buchan, Howard Duggan, Sam Jones, Brett Gadenne and Rhys Fox speaking on this panel. Andrea Smith facilitated the Music Business Matters panel with Paul Curtis, Barry Bull, David Dean and Tim Price speaking on this panel. Breaks between panels were provided to enable attendees to interact with each other, network and share whilst being entertained by some of the Sunshine Coast’s world-class artists: Van Larkins, Dubarray, Ayla, and Matt Stillert. This free half-day conference was attended by local musicians, agents, songwriters, managers, creative entrepreneurs, producers and music students who went away with some really good info/contacts from this event which will be back next year bigger and better. A big thank you has to go out to TAFE Queensland East Coast who gave the venue to the organisers of this event to use for free and sound, video and photo students came and did the sound, video and photos for free at this event. Also, a big thank you goes out to all the speakers who gave up their very busy time to come and speak on the panels and give away some really great content and insights into the business. The catering and showcase artists were paid from this event through the RADF. Contributing Organisations that made this event/afternoon possible are: Hostile Entertainment, Miss Music Biz, QMusic, Sunshine Coast Creative Alliance, Sunshine Coast Council, TAFE Queensland East Coast, The Regional Arts Development Fund.